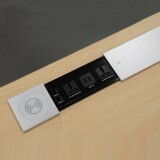 Bottom running shutters up to 45Kgs. 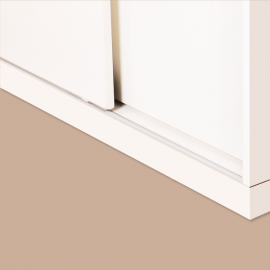 Cut a slot of 2mm wide & 6.5mm deep on bottom of cabinet, 8.5mm wide and 12.5mm deep slot on top of the cabinet and insert the dome track and top track into the slot at bottom and top of cabinet respectively, as shown in Fig. 2 & Fig. 3. For dimensions refer Fig. 1. 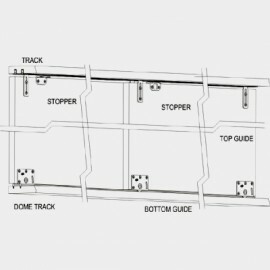 Fit the catch with screws into the Top track as shown in Fig 4. For dimension refer Fig 1. Drill Ø35mm cavity 13mm deep on the bottom of the shutter as shown in Fig. 5 and screw the bottom guide. (Shutter thickness should be ranging from 16mm to 23mm). Fit the top guide and stopper onto the top side of the shutter as shown in Fig. 1. (Don’t tighten the screws fully. Screws should be free enough to slide the top guide down). Fit the stopper onto the top side of both the inner and outer shutter as shown in Fig 6. For dimensions refer Fig 1. 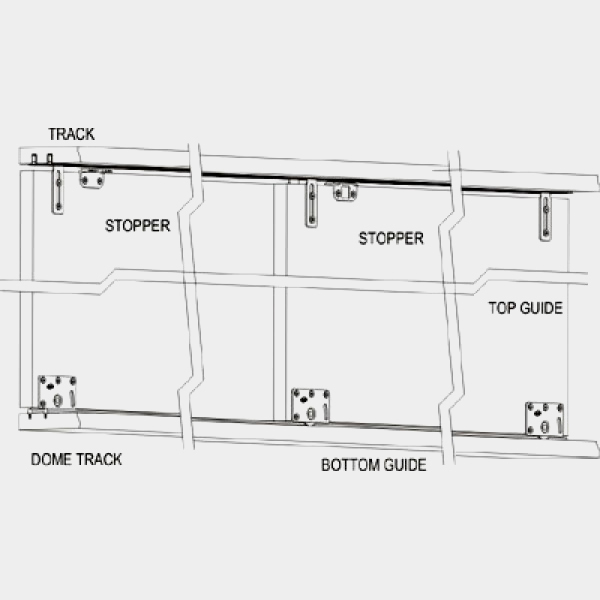 Rest the bottom guide into the dome track by tilting as shown in Fig. 7. (Note: Always engage the outer shutter first). Slide the top guide up into the top track and tighten the screw as shown in Fig. 8.